1 How to make a rose out of paper origami? 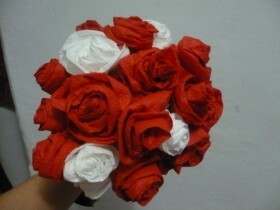 2 How to make a rose out of colored paper? 3 How to make a rose out of corrugated paper? roses, made with his own hands made of paper, can be a wonderful decoration of interior, accessory gift box decoration or just a pleasant surprise for the holiday. Master the technique of making paper flowers can anyone. With minimal time and expense result is stunning. How to make a rose out of paper origami? Circuit for producing a flower origami technique is very simple. It allows you to make a nice souvenir in just a minute. To make a rose out of paper you need to start to practice on a simple napkin - it is soft, supple and has a suitable size. Of course, It is much easier to follow the pattern, presented in video form, but in this case all the stages can be explained even in words - so simple. Napkin decomposed on the flat surface, turns and straightens. You should begin with the far side of yourself: it is necessary to gradually bend toward the center or in a tube, or simply turning 3-4 fold. Next, you need to form a rosebud. For this cloth is wound on 2-3 finger a hand, curl direction - toward the center of napkins. The bud should fill without folds, sharp edges. Stepping back from the top of the flower to 3-4 cm, to start looping napkin to the opposite edge of it - thus rose stem to be formed. When the stem is ready to mid napkin, you need to pull up the side of her corner - so be prepared sheet. Now we have to tighten the stem to the end and straighten the leaf and bud - rose from napkin ready. There are other methods of making paper flowers, in particular, roses, origami technique. One option is the so-called Kawasaki Rose. A description of, how to make the paper rose from such adding method, it is best to look at the video. How to make a rose out of colored paper? For the manufacture of a flower will need colored paper, scissors and glue. On colored paper sheet is necessary to depict the likeness spiral. need to draw, starting from the center, gradually moving towards the edges. The line must be perfectly flat. Much more realistic is, it give some waviness. Next, you need to cut the spiral drawn line. Then taken a pencil, which obtained a spiral wound, since its side of the. Wind should be maximally tight, but carefully, so as not to tear the paper. Thus the paper web is wound on a pencil, until you reach the middle of the. At this point, he pulled out a pencil, Flower must deal. You can hand a little help separate the petals from the center to take the desired shape. The resulting rose middle need to pour the required amount of glue, that he rastoksya, including on the middle of the spiral. Rose need to squeeze your hands or press, to glue froze correctly. How to make a rose out of corrugated paper? Crepe paper is sold in stores in rolls or individual sheets. To make a rose out of paper, you need to choose a beautiful leaf color, and you can start. 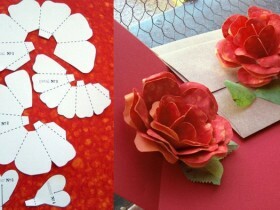 Paper is stacked in stages, forth from it cut out the shape with scissors, resembling outlines double rose petals. They can be a bit simulate fingers, to give a natural and realistic. Then you take the wire and wrap it a narrow strip of corrugated paper, smeared with glue – this will be the core. 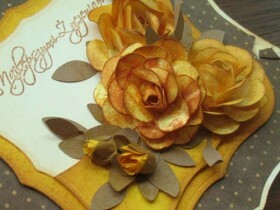 Next, you will work very laborious - attaching cut petals with glue to the middle,. The final stage to do the stem, Tape off the green wire strip of corrugated paper, and connect it with a bud.